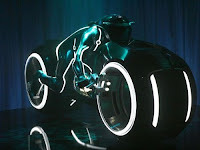 Tron can stir up some widely ranging opinions amongst geeks and scifi fans. There is no doubt that it is visually stimulating, and a technological marvel of it's time. I've always felt thought that the intended story was much darker than Disney was willing to make in 1981. This is the biggest reason I'm looking forward to Tron: Legacy. As this movie has been slowly revealed over the last year I've gotten more an more exited that they are actually listieng to the fans and making the Tron Movie that we all want to see. Though it is a Flynn & Son story in the same vein as Crystal Skull, it's looking like it will hold to the precepts of the original fairly closely.